Ride Time is different from other used car dealers in Winnipeg. Why? Because here, we’re a family — literally and figuratively. If you haven’t met our Ride Time family yet, consider this an introduction of sorts. Nice to meet ya! The story of Ride Time goes way back — three generations, to be exact. 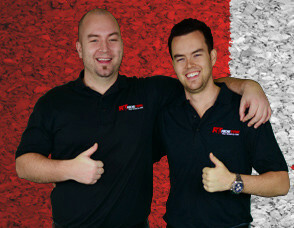 The owners of Ride Time, Doug and Andrew MacIver, are third-generation used car dealers in Canada. Their grandfather owned Midway Chrysler in Winnipeg; their dad owned two Chrysler stores in Toronto; their uncle currently has a Chrysler store in Toronto; and their cousin has a Ford store in Winnipeg. Clearly, the MacIver brothers come from a long line of car dealers in Winnipeg. But what makes Ride Time different? Meet the Brothers of Bargains: Doug and Andrew MacIver. First, there’s Andrew MacIver. This kid knew he loved cars from the ripe age of six. He started “going to the store” (we can’t say “working” on account of child labor laws and all that) as a greeter for his dad’s dealership. Later, he started washing and detailing vehicles part-time. Finally, when Andrew reached 18, he began working full-time at the store. He went to school for four years, specializing in automotive marketing management; when he graduated, he and his dad started what is now Ride Time. And then there’s Doug MacIver. Where Andrew had a passion for cars, Doug had a passion for sports. But this guy didn’t fall far from the tree, either — their dad had a very successful career for the Bombers in the CFL. But Doug’s sport was hockey, not football; he went on to play professionally for nine whole years (the last three of which were in Europe). When he returned to the family business in Winnipeg, he was a little unsure about what his role would be — but after getting a degree in web marketing and e-commerce, he knew he’d found his niche at Ride Time. And then, right at the height of success for the Ride Time family, everything came crashing down. Just a few years ago, Doug and Andrew’s father passed away unexpectedly. It was a huge blow, both to the family and to the business. Their father had meant everything. Join the Ride Time Family! Yes, Ride Time may be a family-owned dealership, but you don’t have to be related by blood to join our family. In fact, our family is growing anyway — just recently, Doug and his wife, Meagan, had a beautiful baby girl! Along with bringing children into the world, the Brothers of Bargains have been making other important strides. Today, Ride Time has blossomed into one of the premier used car dealerships in Manitoba, specializing in excellent customer service and car loans for all credit situations. If you have any questions, please reach out to us. We’re always happy to talk, whether it’s about cars, community, or — our favorite — family!